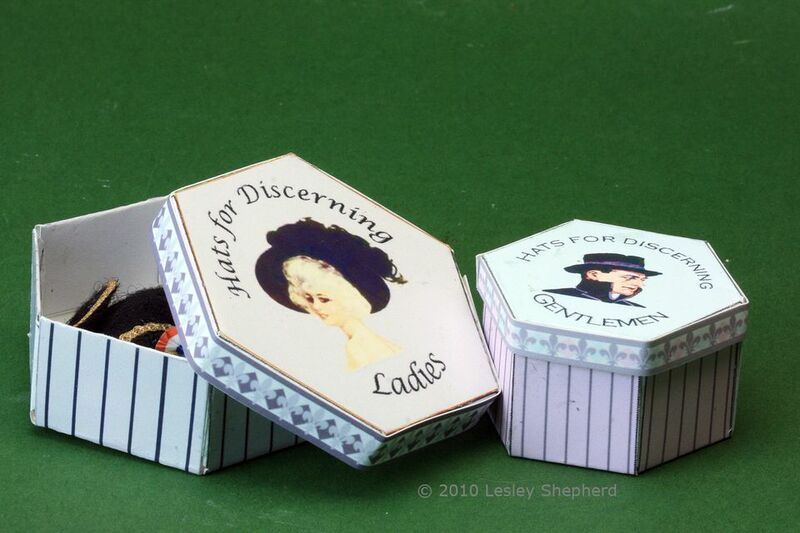 These printable miniature hexagonal hat boxes are sized to fit large brimmed hats in dolls house scales, or smaller more upright hats, or other miniatures. The boxes are available in the same color schemes as the printable shop bags, and printable shop boxes. All of the designs are available as printable pdf (acrobat reader files) which can be downloaded on the pages which follow linked to the various color schemes. The 1:24 scale boxes are available with all three color schemes for the large brimmed hat boxes on one page. The 1:12 scale boxes are available by color scheme as either large brimmed boxes or regular hat boxes. Print the designs from the linked pdf files (see each color page following for the links) on printer paper, light card or matte or gloss photo paper. After printing, coat the designs with acrylic varnish or sealant if you wish. When the varnish is dry, cut the designs out along the outside lines and fold them to shape using a straight edge or bone folder. Fold or score the boxes along the straight edges between plain colors and lined sections. The plain colors are the box lining. Fold or score across the base of the box by running a fold that continues the outer line of each box side, (making a hexagon for the box base.) Score the boxes so the tabs will fold in. Glue the non tabbed sides to the tabs keeping the plain sections of the box upright until the glued tabs have dried. Fold (and glue if you wish) the plain sides to the inside of the box to make a lining. Cut an edging strip and fit it around the box top over the tabs, bending it crisply at the corners. The printable boxes for the 1:24 scale are all in the larger size to fit wide brimmed hats. They print with two boxes in each of three color schemes, Robins Egg Blue and Lavender, Cream and Gold, or Silver, all on the same page. To make these boxes, follow the instructions on page one of this tutorial. The pdf (acrobat reader) file for the 1:24 Scale Brimmed Hat Boxes is designed to print on a letter or A4 sized sheet of paper. The printable boxes for the 1:12 scale hexagonal hat boxes are in two sizes to fit wide brimmed hats and regular smaller hats. They print with two boxes and a choice of three lids all on the same page. To make these boxes, follow the instructions on page one of this tutorial.The pdf (acrobat reader) file for the 1:12 Scale Brimmed Hat Boxes or the 1:12 Scale Regular Hat Boxes are designed to print on a letter or A4 sized sheet of paper. A coordinating set of Robin's Egg Blue and Lavender printable wallpapers is also available in these color tones. The printable miniature boxes for the 1:12 scale gold and cream hexagonal hat boxes are in two sizes to fit wide brimmed hats and regular smaller hats. They print with two boxes and a choice of three lids all on the same page. To make these boxes, follow the instructions on page one of this tutorial.The pdf (acrobat reader) file for the 1:12 Scale Gold and Cream Brimmed Hat Boxes or the 1:12 Scale Gold and Cream Regular Hat Boxes are designed to print on a letter or A4 sized sheet of paper. The printable miniature boxes for the 1:12 scale silver hexagonal hat boxes are in two sizes to fit wide brimmed hats and regular smaller hats. They print with two boxes and a choice of three lids all on the same page. To make these boxes, follow the instructions on page one of this tutorial.The pdf (acrobat reader) file for the 1:12 Scale Silver Brimmed Hat Boxes or the 1:12 Scale Silver Regular Hat Boxes are designed to print on a letter or A4 sized sheet of paper.